Whether you’re hoping to get through the holidays unscathed or looking forward to all of the festivities, food and family, there’s one thing that always follows the Thanksgiving and Christmas holidays and that’s a brand new year. So before we begin writing our new year’s resolutions, we thought we’d take a look at what 2012 brought us in charge cards. Which ones offered the best and most perks and benefits? Which ones rose to the top? Here are some of our favorite charge card offers. Of course, when you think charge cards, the first thing that usually comes to mind is American Express. They have mastered the charge card and of course, no “best of” list would be complete. But AMEX isn’t the only player in the game. JPMorgan Chase has its own charge cards – and it too is a formidable player in this particular credit classification. Both are quite competitive in this sector of credit – and both deliver superb financial products. 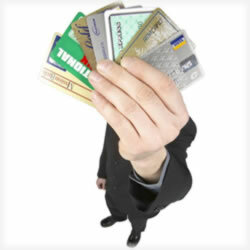 There are many reasons why people choose charge cards over traditional credit cards. Those who pay their balances each month are especially drawn to these offers. Small businesses also like the idea of having extra buying power, but who can also pay the balances in full. Charge cards give you more control over your finances and while charge cards are designed to be 0% APR, there are now offers that do provide some flexibility – such as the option of breaking the balance up over two or three months. There are also no pre set spending limits, making them an ideal solution for those whose shopping habits vary. The Business Platinum Card from American Express OPEN has a current promotion that allows members to earn an additional 25,000 rewards points just by spending $5,000 during their first three months of membership. When you enroll, you can select an airline of your choice for an annual $200 statement credit that can be applied to things like baggage checks, refreshments on the flights and any change fees you might be hit with. This is a great option for those who travel for business. Not only that, but when you redeem your rewards with the Pay with Points program, you’ll enjoy a 20% travel discount bonus. There are more than forty premium benefits and perks for you to use your rewards with. A few of those include the option of having a dedicated business consultant or around the clock concierge service. Plus, you’ll receive complimentary airport club access to more than 600 airport lounges. This can equate to a savings of $950 every year. The big bonus with this credit card is the invitation only events you’ll have access to. This is perfect for those business owners who routinely entertain their clients or have training sessions off site. There are areas around the world that are suddenly opened to Business Platinum Card members. Of course, there are no pre-set spending limits with this American Express. A Note About AMEX OPEN: American Express created its OPEN network as a service to business owners who can take advantage of built in savings, great rewards and powerful financial and marketing tools. You’ll save instantly on things like car rentals from Hertz and FedEx, special corporate rates on your flights, hotels and other expenses. These are exclusive to OPEN members and the benefits are many. Be sure to enroll in this wildly popular program once you sign up for your American Express business card. This Chase Ink Bold Charge Card allows you to earn up to 50,000 bonus points quickly. The first 25,000 kick in after your first purchase while the second 25,000 bonus points come after you spend $10,000 in the first 3 months. That equates to more than $600 in travel savings when you use your Ultimate Rewards. Plus, you can earn 5x points for every dollar spent on eligible business buys, along with 20% off of your travel redemptions. There are no restrictions or blackout dates, either. No worries about interest since it’s a traditional charge card, though you will rest easy with the flexibility of this charge card. This relatively new American Express business charge card includes an instant 5,000 bonus points after your first use. These points never expire and can be used for a number of things, including travel, office equipments and even gift cards. There are no pre set spending limits, though there is no flexibility in your payment options. The good news with that, however, is there are APR considerations. The annual fee is $95, but it’s waived your first year. It really is a strong choice for business owners of all size and definitely one you’ll want to strongly consider. Your rewards points are issued one per every dollar spent. This is also another American Express product that offers OPEN. It’s one of the more popular choices among business owners, partly because of the many savings opportunities. For a limited time, you can earn a 2% discount for the first six months of membership. That’s 1.5% early pay discounts along with an additional 0.5% savings on all other purchases. This is applicable for your first $250,000 spent on the Plum card. The annual fee is slightly higher than other other cards featured in this article. The first year is waived, but after that, it’s $250 annually. Need additional cards? Those are complimentary. If you use your American Express often, odds are the higher annual fee isn’t going to be a deal breaker. Only you know for sure, though. The OPEN network is built into the card, which provides the same powerful marketing and financial tools as its sister cards. This one service has allowed millions of businesses make stronger decisions when it comes to their finances. Are you a business owner? If so, do you carry the classic charge cards? Share your story with us and let us know if a charge card is always the right choice for business owners. What kind of perks draw you to these credit card offers? Disclaimer: This content is not provided or commissioned by American Express. Opinions expressed here are author’s alone, not those of American Express, and have not been reviewed, approved or otherwise endorsed by American Express.